Concerning mathemeticians, soothsayers, and similar evildoers: The study and teaching of the science of geometry is in the public interest, but who so ever practices the damnable art of mathematical divination shall be put to the stake. The reason of how and why isopsephia, gematria, and sacred geometry were invented is easy to understand as soon as one sees how the ancient Greeks incorporated numbers into their alphabet. The art of Gematria combined the literary skills of writing biographies, histories, plays, parables, riddles, and fiction with cutting edge mathematics, geometry and drafting. Using gematria, incredible stories could be crafted into geometry puzzles that could be proved true, much like a geometry proof, provided that the gematria value of certain key names, words, dialog, and verses were carefully crafted to match and describe the dimensions of its underlying diagram. Plato was one of the earliest Greek philosophers who used mathematical allegories in two of his most important works, The Republic and Timeaus. To date, no ancient documents have been discovered that explain the secret meaning Plato's work. Other literary works based on the art of gematria and sacred geometry must have existed but no examples were thought to have survived to modern times. The very word "gematria" is missing from many large dictionaries and when a definition can be found, the explanation is either wrong or partially correct. The mere mention of "Sacred Geometry" or "Gematria" elicits a derisive snort, raised eyebrows, rolled eyes, a shake of the head side to side, a suppressed smile, or a blank stare from virtually every Doctor or Professor of Religion today. 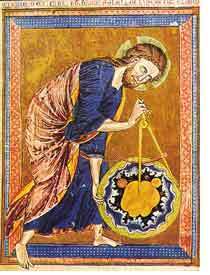 However, at the time the gospels were written in the first century AD, the influence of gematria and Sacred Geometry was pervasive. Doesn't it make sense to at least look at new ideas and evidence with an open mind rather than to summarily dismiss it out of hand? Although gematria existed hundreds of years before Christianity, it seems to have reached its zenith in the latter part of the first century AD and then disappeared in the short span of about one generation before the last book of the New Testament was written. Chapter 1 will introduce you to the literary techniques used by the anonymous authors who wrote the gospels of the New Testament to transform Jesus and other characters into circles with circumferences equal to the gematria value of their names that moved on a special graph in sync to the imagery of their stories. This book will show how these gematria masters used their graphs to literally raise Jesus from his tomb and craft a mythology that changed the history of the world. This book will reveal that the best examples of ancient Greek gematria and Sacred Geometry were always hidden away in plain sight in the Greek New Testament.